“We love our new table top, definitely better than the original. We are so looking forward to putting it in situ and the red wine is ready to be uncorked. 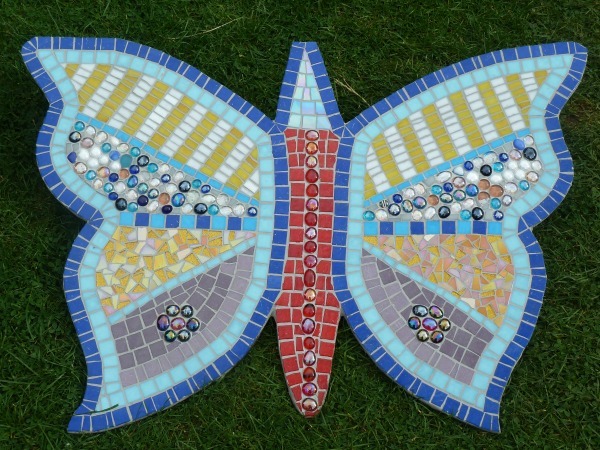 “I first came across Rosanna’s Mosaics in September 2017 on the Borough of Ealing Art Trail (BEAT). A small triptych depicting a sail boat bathed in brilliant sunshine and bobbing up and down on a cobalt blue sea was particularly memorable. It reminded me of my childhood holidays on the Adriatic. So, when I moved house in 2017 and was faced with an expanse of brick wall to fill, it occurred to me that a mosaic by Rosanna would liven up the space very nicely. A year later, Rosanna’s large triptych adorns my garden beautifully. 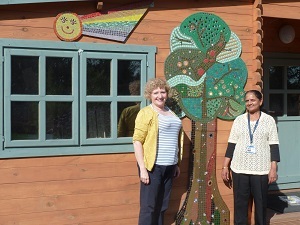 “Rosanna Henderson has worked for two years on a voluntary basis on a community project at the Log Cabin children’s charity, producing 11 fabulous mosaics on a nature theme , which are charmingly scattered around our sensory garden and playground. We found working with her a joy: she is passionate about her work and is always open and communicative with adults and children alike. This was a wonderful partnership for us – we knew that when she agreed to take on the project, she would deliver it as promised and remain totally committed throughout. Just loved this Japanese – like Mosaic, Bird and Flowers. Rosanna’s artistic flair protrayed a peaceful and meditational delight, which one would never tire of looking at whilst admiring her skill.